Taking your kids to the zoo is a great idea for a family outing. Besides allowing you to bond with your kids, visiting the zoo also opens the opportunity to learn more about the animal kingdom. Granted, this might not be the best time of the year to stop by your local zoo, but don’t fret -- there’s bound to be an app for that. Introducing Lazoo Zoo, a brightly animated app from Lazoo (Magic Stickers!, Let’s Color! ), which lets kids feed various animals at a magical zoo. Described as “magical”, Lazoo Zoo is home to many animals with unique abilities. The zoo is divided into five play areas. Each area encloses an animal, which juniors feed with all sorts of food from the food dispenser: fruits, vegetables, burger, birthday cake, soap bubbles, and even an umbrella. The animals react differently to the food they are fed -- for example, the ape will sprout new hairstyles on his head when he is overfed, and the chameleon will change its color depending on the food. With the giraffes, players can watch their spots change shapes and colors depending on what they are fed. The picky lion will only eat the food that matches the silhouette he scribbles in the sand. Juniors can experiment with different kinds of food by swiping through the dispenser. Should they feel that the kinds of food in the dispenser are not to their liking, they can collect additional foods that appear randomly on the screen. 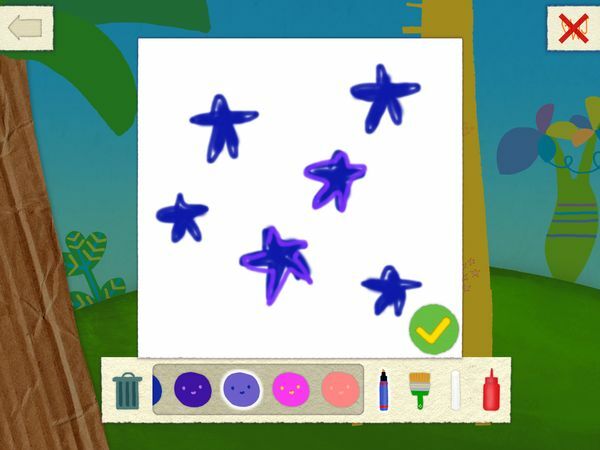 They can also create their own food by tapping on the paint brush icon. The app will bring up an empty canvas, on which they are free to draw anything they like. A standard drawing set is provided, which includes a rainbow of colors and four kinds of tools: a marker, paintbrush, chalk, and paint in a squeeze bottle. In addition to feeding the animals, juniors can also visit the photo booth and take pictures with various animals. Five adorable frame designs are available, and juniors can tap on the animals on the frames to make them smile. Lazoo Zoo is a simple and delightful app suitable for juniors ages 2+. The app features a rule-free, timeless gameplay. It has neither text or audio instructions, so no reading skills are necessary to play the app. The app is available as a free download from the App Store. It does not contain in-app purchases. There is a parents section which contains a brief description of the app, as well as unobtrusive links to the developer’s other apps. Both sections are protected from tiny hands by way of gesture tests. Lazoo Zoo is a cute, lighthearted app with a lot of potential. Both the idea and the execution has been well done. As with other Lazoo apps, the graphics in Lazoo Zoo are bright and colorful, and the animations fun and eye-catching. There is plenty of good humor and easter eggs in the app that will keep juniors occupied for a long time. For example, I love how the tiny bird by the hippo’s pond grows bigger when you feed it, and then burps really loud before shrinking back to its original size. I also like that the app incorporates creative activities to encourage juniors to imagine and express themselves. The drawing tools are nothing extraordinary, but they are straightforward to use. The photo booth is also a nice touch. Lazoo Zoo is a fun little app for juniors to learn more about animals, unleash their creativity, and enjoy themselves in the process. The app is well made, with colorful graphics and entertaining little animations that will bring smiles to your faces. There is also a photo booth for taking commemorative pictures of your family’s trip to the (virtual) zoo! A highly recommended app, especially for young kids ages 2+.